1. No more votes please. The theme this week is – Metallic. And has been chosen by – DrewDale. The deadline for entries is 9:00pm (UK Time) on Sunday July 21. 2. Please keep your sig family friendly. 4. Modifying or replacing your sig is not permitted after submitting your entry. 6. Your entry must be made using paint.net, please don't use an outside image editor and try passing it off as PDN work. Edit because I uploaded wrong size. I hope vertical isn't against the rules,something different. All made in PDN with textures, blending modes and several plugins. The deadline for entries is here and its now time to cast your votes. This week we have an impressive 18 entries – You may vote for 9 of them. Removed Welshblue's entry by request from the poll. Just to clarify and apologies to those who'd voted but I broke the rules and edited my entry twice. Once to fix the image size ... twice to submit an upgraded entry. No only a fine artist, but honorable too. What can I say mate. The voting deadline is here and its now time to announce the winners. Fourth is shared between Sasha & Mottoman with 11 votes each. Thanks to all who took part and to all the voters. 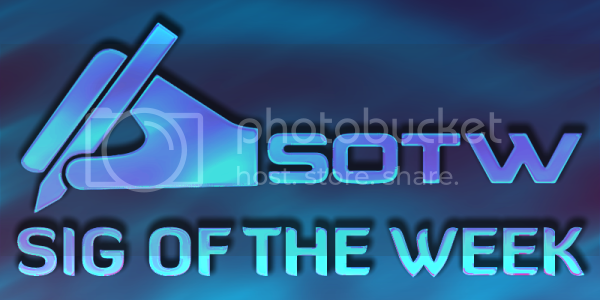 I will PM Helen and launch SOTW#87 as soon as we have a topic.